← What constitutes a QSO? It’s no secret that I’ve been meaning to do some aerial work for a while now and it’s just taken much longer than planned. My long wire starts just under the eves of the house and goes to an anchor point a mere five foot or so above the ground which really makes it very inefficient. I’ve been gradually picking up all the parts to make a doublet and I’m nearly there. 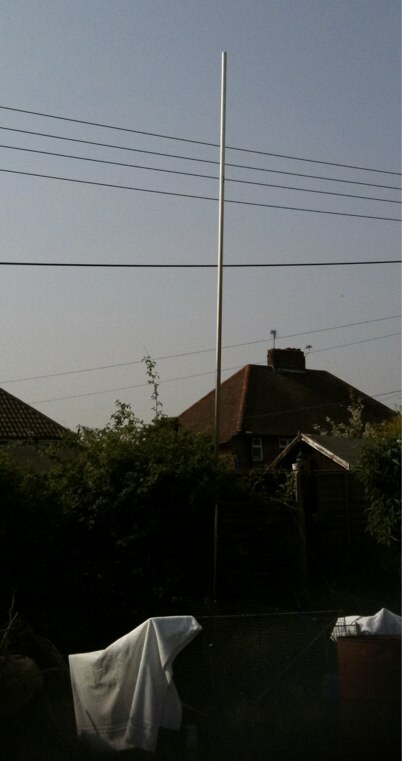 Last week I got home from work to find a new pole had appeared at the bottom of the garden. To be exact, a 20ft aluminium pole had been delivered and nailed to a concrete fence post for me by Tony, G0MBA. I must stress that the angle of the photograph makes it look significantly closer to the overhead cables than it actually is. It’s well clear of them and is totally safe. My wife who has no interest in radio at all decided the pole is Welsh and named it Dai. That’s Dai Pole. Today I decided that in the interim I wanted to get my long wire moved so that it goes to the top of the pole rather than end at head height so I took a trip to a local Chandlers and picked up a bolt through eye and a block (pulley) along with 40ft of rope. 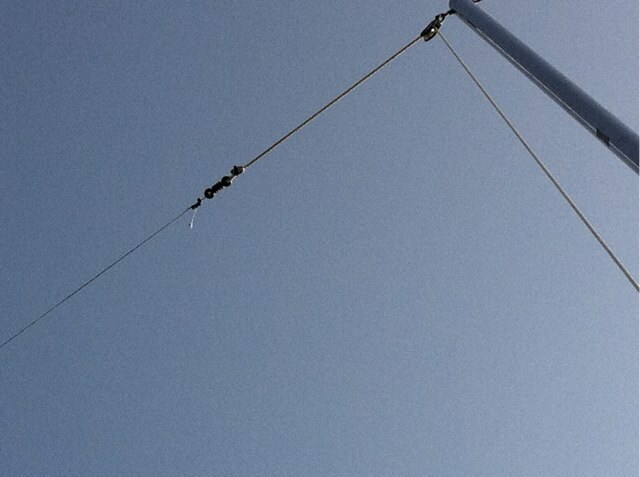 Once I was home, I lowered the mast, drilled a hole through the top and fitted the eye and pulley. I cut my aerial back to the appropriate length, connected it to the rope with an insulator and threaded it through the pulley. I hoisted it back up again and did some quick tests. Initial impressions are good, performance seems increased on how it was before and my SGC Smarttuner will now match it on all bands from 160m through to 10m which is an improvement because it wouldn’t tune on top band before. My only concern is that there’s a lean of the pole towards the direction of the aerial and I’m hoping that won’t be too bad once I put the doublet up. 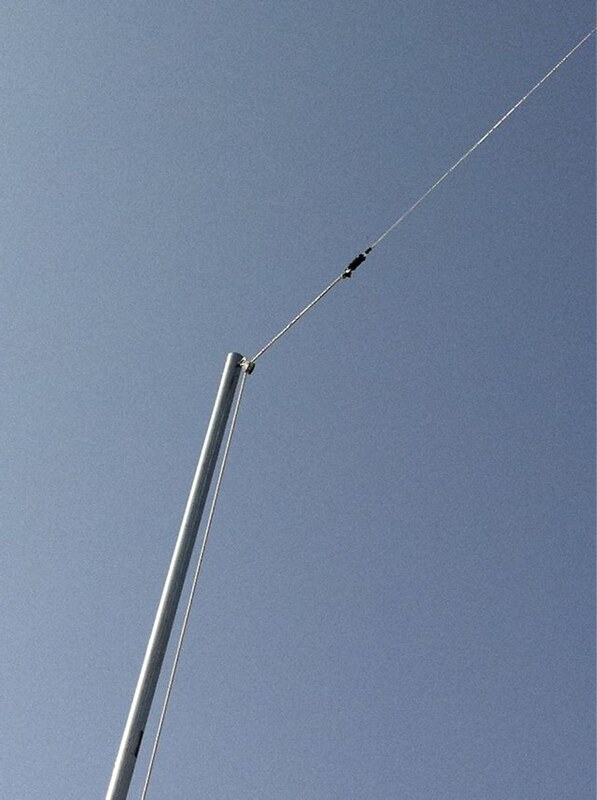 It’s a heavy duty pole but it is only anchored for the bottom five foot or so, leaving fifteen foot to lean slightly. Hopefully it’ll be OK. Surely, it’s also a Trout pole…?